Welcome to Craftin Desert Divas Spooktacular Halloween Blog Hop!! I'm so happy that you could join us today! If this is the first time that you have hopped with us you won't be disappointed. My friends are all amazingly talented. 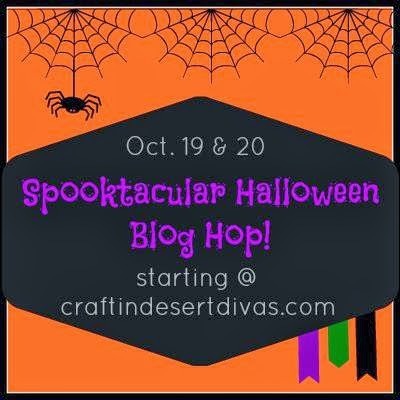 This is Day 1 and the start of the Spooktacular Halloween Blog Hop! You will not only get some inspiration, but you could win GREAT prizes, too!! You must FOLLOW and COMMENT at all of the stops both days to have chance to win. For this two day hop each blog on both days will be offering a prize from one of the sponsors listed above!!! You must visit each stop both days to be eligible to win. Winners will be announced Oct. 22. 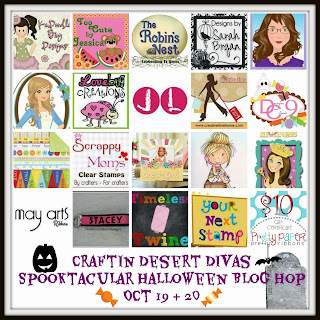 I will have a complete list posted here on Craftin Desert Divas. My sponsor for Day 1 is.. 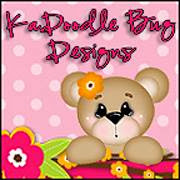 Winner will get $15 in KaDoodle Bug Designs patterns of their choice. I would love for you to visit and "Thank" Melissa at KaDoodle Bug Designs Facebook page for being such a wonderful sponsor!! She always has the cutest freebies and patterns!! Here's my project for today.. I made lollipop treat holders!! How fun are these? For this lollipop holder I used KaDoodle Bug Designs Got Treats pattern. For this lollipop treat holder I used KaDoodle Bug Designs Prim Halloween pattern. The super fun paper is from Doodlebug Design Halloween Parade. I added some LoveBug Creations Rumple Ribbon, sentiment banner, button and some other misc embellishments to complete them. I will have a new project to share with you tomorrow. Your next stop is the super talented Jessica. Here's a complete list of the line up in case you get lost along the way. Adorable! I'm loving the little dragon. Great choice on your paper as well. Thanks for the hop. That pumpkin witch is just adorable!!! This is the first time on your blog hop and the first page is awesome! great first day on hopping around left comment on all except tracy didn't have anything up to comment on yet. It's up now. Hope you will visit her. Her project is adorable. I can't find the last bloghop participant's entry. When I click on it the last posting date is Friday October 11th?? Am I hopping too early or did she drop out? Awesome bloghop. You are all so talented!!!!! Her project is up now. Sorry for the delay. Be sure to visit her project is adorable!!! Tara, these are adorable! I love every detail ! the lollipop treat holders came outperfect.. I love that dragon! He's so cute!! I have never been to this site but I must say your die cuts and the related projects are CUTE!! Thanks for sharing!! I love those lollipop holders. Cute idea. ~Robin B.
Oh wow these holders are just such so cute and a fab idea for Halloween. The kids would love these. ohhh my gosh....your project is sooo stinkin cute...love it! Just wanted to say what a fabulous Halloween Blog Hop. Such great talent all along the way. Thank you so much for sharing such stunning Projects. These are just adorable, Tara. I love how you shade your pieces! You come up with the CUTEST projects my friend. Thanks for letting me be part of this super fun hop! Very cute projects. I really like the pattern paper that you used. These are so fun Tara! That little dragon is too cute and I love the face on the pumpkin! Thank you so much for inviting me into this hop! These are so super AWESOME Tara!! LOVE the adorable files you used!!! Thanks so much for sharing and hosting this FUN hop!! Super excited to be a part of all the fun!! Have a GREAT Saturday and weekend!!! How adorable! Such a fun way to dress up a little old sucker. TFS! Your lollipop holders are so bright and pretty. Tara this is just perfect for Halloween! What a group of talented designers. Such fun treat holders. Super creative! Absolutely love Kadoodle Bug files. They are all so cute and she is always so generous. TOO darn cute!! I love this and I am scrap lifting it as well!! Thank you for letting me be a part of this WONDERFUL Hop!!! I am very Happy to be HOPPING with you!!! Super cute projects. love the papers and the details. thanks for sharing. Awesome Treat Holders Tara! LOVE LOVE LOVE!!! The designs are too cute and your paper is FABULOUS!!! Thanks so much for coordinating this FUN blog hop!!! Super cute idea. Cute cute dragon. Love the papers. Tara, what a fabulous hop! Such a great group of designers!! Love your project super cute lollies, adorable faces!! What cute lollipop holders! I LOVE that dragon pattern! Wooo hooo! I can't believe this day has finally arrived! I have had your hop advertised on my blog forever! lol! Love your cute lollipop treat holders! Adorable treats Tara, love the papers and colors. The sweet dragon is my favorite!! Grand idea - lollipop holders! Your tags are super cute and love the paper. colors & faces. What fun blog hop thanks for having it for us !! I cant see the projects for the eyeballs, candy and skulls falling.....it is very distracting. How cute are these??? Love them...off to hop! Darling lollipop holders, love the cute critters! Adorable! I love the pumpkin witch and the dragon! What a fun hop. Your treat holders are adorable! I love the bright colors you used. You always have such fun projects, love your creativity Tara! Oh my goodness these are wonderful! I really LOVE that dragon. TFS. I Love the dragon. He is so cute. This are SUPER CUTE Tara!!! Love the dragons cute face!! Tara, these are too cute!! Thanks so much for allowing me to be a part of this great hop! Ilove your lollipop treat holders, especially the little dragon. Such a great choice of papers and colors, and I love your blog, too! What a cute idea, I need to try this! Wonderful love the treat holders, the colors, and your designs. TFS.